Natural disasters and the destruction they produce—especially to human life and to property—bring to mind our desire to explain both cause and effect. Normally, there are two choices: chance or God. Even as we find scientific cause and effect, the ultimate cause is often thought of as chance—these events just happen. On the other hand, the destructive nature of natural disasters such as hurricanes and fires fueled by fast-moving winds has led some within and without the church to rightly attribute the cause to God but then to specifically assert that God’s motive is his wrath for some perceived human failing. What should we make of this? Chance or God? And what is the reason or motive behind these destructive storms, floods, and fires? First of all, this is not a discussion in the abstract. The power, terror, physical destruction, and psychological fear these events bring upon us are real—they can be seen, they can be felt, and they change us. Unless one has “ridden out” the terror of howling wind, rain, thunder, lightning, and fire, or lost a family member or friend, suffered injury or loss of property—along with the memories that are embedded in our homes—it is very difficult to imagine what these catastrophic events are like. Hurricanes, floods, and burning are terrifying and destructive. Our hearts reach out to everyone, friend and foe alike, who falls into their path. Are these natural disasters the products of chance, fate, or the wrath of God? To what do we attribute them? 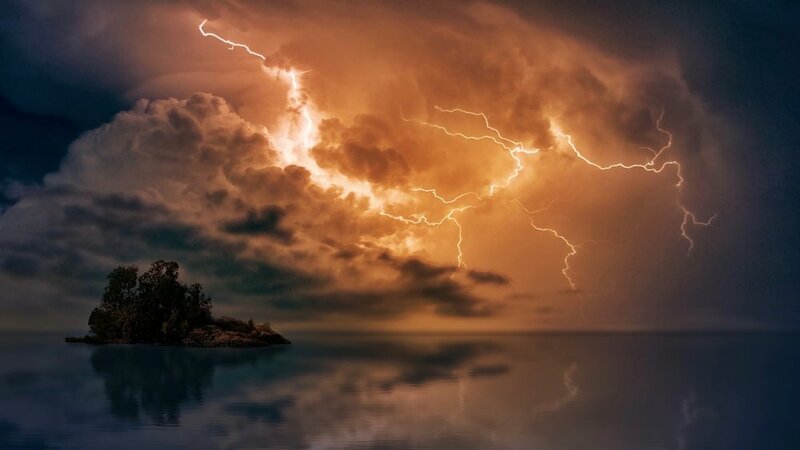 The thunder and lightning are described as the voice of the Lord. The lightning of his thunderous voice comes forth like flames of fire. The power of the storm is seen and heard, and it is so powerful that it breaks trees in Lebanon. Surely such a storm strikes fear in those who experience it. Boarding up homes and businesses, evacuation orders, the painfully slow escape on a jam-packed freeway—these are all actions born from a healthy fear and respect for the power of the storm. Yet the Psalmist has more to say—more to say to us while our emotions are raised by these powerful storms that seem like the thunderous, flashing voice of God. The Lord rules all. He is enthroned not in the flood, but is over the flood. He rules it as he rules over all creation. God is over all and does what he pleases (Ps. 115:3). He makes the clouds, the lightening, the storms, the rain (Ps. 135:6-7). Nothing can stop his hand (Dan. 4:35). He is all-powerful. And he displays his glory in creation, often in the storms that bring awesome destruction. Storm in the Mountains, by Albert Bierstadt, c. 1870, Museum of Fine Arts, Boston. So, what do we make of all this? Storms are displays of God’s amazing power and glory. They can be quite beautiful—think of the cloud and storm pictures so often posted on Facebook or displayed in glorious paintings like those of Albert Bierstadt. Smaller storms bring needed rain and refreshment. On the other hand, the destruction, death, and distress that hurricanes, floods, and fires bring are tremendously terrifying until they pass and we experience the peace that ensues as the sun breaks out, waters recede, the smoke fades away. As the Psalmist prays for strength and peace, so also in the path and midst of storms, we pray for the peace that will come as surely as the storm. It is not for us to know the mind of God in everything that occurs (Isa. 55:8-9). We cannot know his specific motives and temporal purposes in particular instances when he brings destructive storms. Yet, God has revealed that he rules over all his purposes, and they will be accomplished (Isa. 55:11). Most especially, God has revealed his will and purpose to redeem and save those whom he has called to himself, those who trust by faith in the Lord Jesus Christ for salvation. By his Word he is pulling his people out of the miry bog and the pit of destruction and placing them on the rock of our salvation who is Jesus Christ. Even though we may not know God’s particular reasons or motives for allowing hurricanes, floods, and wind-fueled fires, we know he rules over them. They do not occur by chance. The glory of God displayed in them can surely be terrifying. Our hearts feel like breaking when friends and families lose thier homes and belongings; yet, to those who trust in him, to those who place their faith in Christ Jesus, they may serve as a consolation by reminding us of the incomparable power and might of God who gives us strength and peace forever. By faith in Christ Jesus alone, may God grant his eternal strength and peace forever to his people. Daniel Rowlands is content editor for Beautiful Christian Life. What Is Making You Anxious Right Now?